Hailing from the east side GA town of Augusta, FUNK YOU is an outgoing burst of energy that is continually climbing their way to the top of the music scene. This “funk” oriented outfit projects multiple musical styles focusing mainly on dance driven grooves with powerful clean vocals. Incorporating intriguing musical composition, tasteful lyrics, and crowd captivating live performances, FUNK YOU is surely to make an imprint on your musical taste. 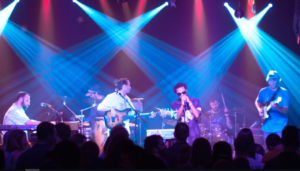 FUNK YOU provides the audience with a furious fusion of influences ranging from Umphrey’s Mcgee, Lettuce, James brown, and Stevie Wonder. By colliding funk, jam, rock, fusion, and prog into one uniform sound, these guys will keep your jaw dropped and your feet moving without stopping. Their songs combine lush ambiance, catchy vocals, and intense shredding simultaneously into a unique well defined sound. For three years the band has been building their fan base in the southern local markets of Atlanta, Augusta, Athens, Statesboro, Milledgeville, Savannah and Macon. They have numerous sold out shows in Augusta and also at the Georgia Theater in Athens. With performances alongside Maceo Parker & Fred Wesley (James Brown horn section), Dirty Dozen Brass Band, Tea Leaf Green, Robert Randolph, Snarky Puppy, and Moon Taxi, the band is paving their way to the festival circuit. FUNK YOU was voted best R&B band by August Magazine and was named Relix Magazine’s “Artist On the Rise” in their July/August 2013 issue. Perseverance and hard work best describe the band’s attitude, so if you haven’t yet, you will be seeing them soon.